Each limited edition Guy Gibson sculpture is hand engraved by Peter with its own unique edition number and will come to you with a signed certificate of authenticity. Wing Commander Guy Gibson the first commanding officer of the Royal Air Force's 617 Squadron which he led in the Dam Busters raid in 1943. This resulted in the destruction of two large dams. At the outbreak of World War II Guy Gibson was a pilot with 83 squadron in 1943 he was chosen to command the newly formed 617 Squadron created to destroy the hydroelectric dams in the Ruhr. To accomplish this they were provided with the bouncing bomb designed by Barnes Wallace. The bombs had to be dropped from 60 feet from a predefined distance to skip across the water in to the dam face and then roll down it to explode at a predefined depth. In order to succeed this had to be carried out at night and on the night of 16th May 1943 Gibson led his force of specially modified Lancasters. Gibson was awarded the VC for his role in the mission but was destined not to survive the war. After a lecture tour of the USA and writing the book Enemy Coast Ahead Gibson returned to active duty but was shot down and killed piloting a Mosquito over the Netherlands in 1944. 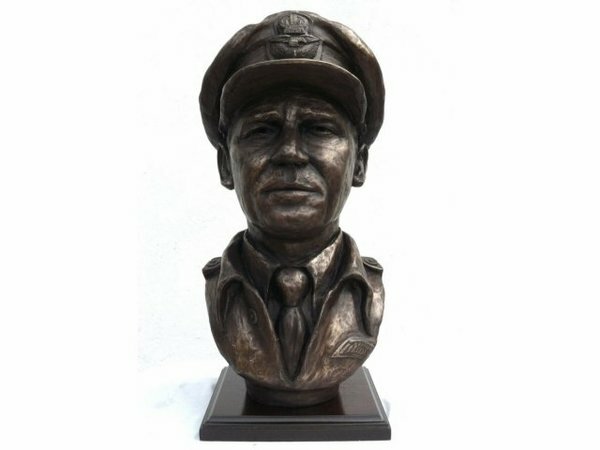 In the words of Marshal of the RAF Sir Arthur 'Bomber' Harris "Guy Gibson was as great a warrior as this Island has ever bred"
This cold cast Bronze Guy Gibson Bust is made entirely by hand by sculptor Peter Close in his studio..